Recently, I had the opportunity to sample dZ10 and let you guys know my thoughts. First of all, what is dZ10? dZ10 is a Super Digestive Enzyme which will improve your health, make you feel better and increase your vitality! 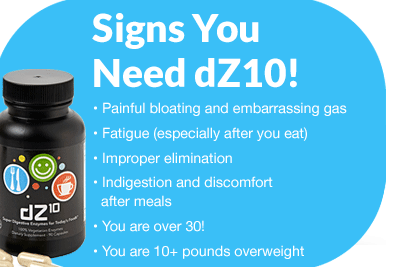 dZ10 provides you with 10 powerful super enzymes for optimal digestion whether eating nutritiously at home or on-the-go. Perfectly balanced for any diet, dZ10 will help your body break down the food you eat so you can better digest your food, absorb the nutrients in your food, and turn those nutrients into energy, giving your body the ability to function at its highest level. Eating a balanced diet and getting regular physical activity, certainly help with keeping your digestive system healthy. However, if you do not have enough digestive enzymes, your body cannot break down the food – which means even though you are eating well, you are not absorbing all that good nutrition. Is dZ10 right for you? Weight Loss- ImImproper digestion leads to improper elimination resulting in bloating and unwanted pounds! But with dZ10 and regular exercise you can properly digest and eliminate waste leading to a slimmer body and happier you! Energy- Improper digestion leads to fatigue! It takes energy to process food and without proper enzymes it’s nearly impossible! 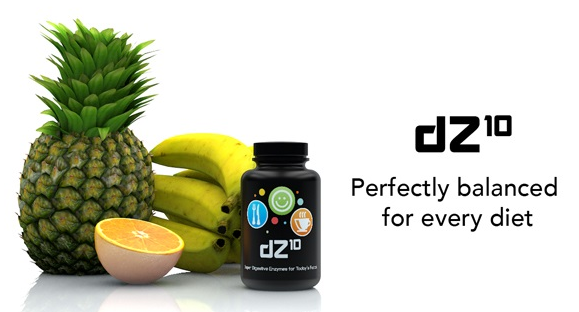 dZ10 will make your body work better so you feel better with more energy for life. Digestion- Don’t just treat symptoms of indigestion - end them! dZ10 works with your body to break down the food you eat, extract nutrients and to eliminate waste products so your body functions at optimal efficiency. Find out more about dZ10 and how to purchase here.